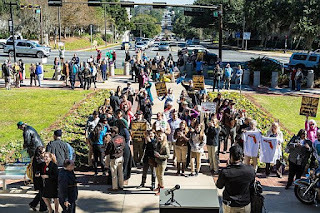 Hundreds of people from around the state descended on Tallahassee on January 20, to participate in the largest anti-fracking and pro-sustainable energy rally in the state’s history. A coalition of health, environmental, and labor organizations decried the state’s continued reliance on fossil fuels and urged state legislators to support Senate Bill 166, a bill that would ban fracking in the state. Lawmakers were also urged to reject SB 318 and HB 191, which would pave the way for fracking in Florida. These bills are being fast-tracked through both houses, and can only be stopped with massive public outcry. Research in other states has shown that fracking has caused water contamination and air pollution, massive amounts of fresh water usage, and led to declining property values. Two bills being heard in the legislature would green light new dirty forms of fracking in places like the Everglades and pre-empt local communities from passing local measures to protect their communities. “The Sunshine State should be utilizing more solar energy, less coal, and banning risky extraction processes rather than laying out the welcome mat for fracking with industry friendly regulations,” said Kim Ross, the executive director for Rethink Energy Florida. “We now know without a doubt that fracking, like cigarettes, damages health,” said Lynn Ringenberg, MD, the president of Physicians for Social Responsibility (PSR). “Let’s push for renewable energy, like solar, wind, water and keep the fossil fuels in the ground. This is the best prescription for a healthy Florida.” PSR recently released a national compendium of peer-reviewed studies on fracking that document alarming health consequences for the millions of Americans living and working in close proximity to fracking. Other speakers at the rally stressed the need for state legislators to implement the Clean Power Plan, a federal plan that would set limits on greenhouse emissions from the nation’s power plants. State officials are debating bills that would prevent Florida from tailoring the Clean Power Plan to fit the state’s needs. The Sunshine states lags behind many other states even though it ranks 3rd in the nation for rooftop solar potential. In fact, many Florida residents and businesses are unable to benefit from solar energy because of restrictive regulations. In addition to the rally, these citizen advocates went inside the capitol, to visit over 90 representatives and senators, to remind them that it is the citizens of Florida who voted them into office, and the citizens to whom they should listen. 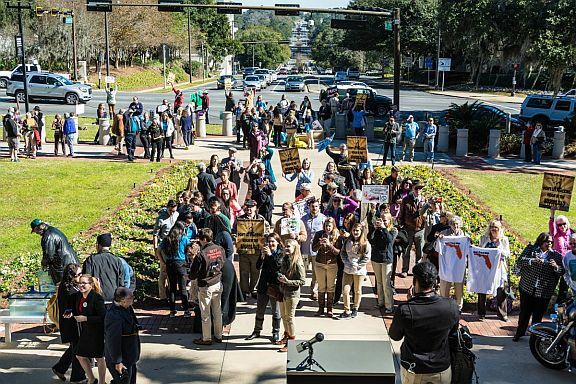 Editor's note: In the last few days, anti-fracking rallies have taken place across the state including in Miami, Tampa, Gainesville and Ft. Myers.